This article presents an introduction to the basic how and what of the sukkah. For a more comprehensive guide to the construction of the sukkah, especially for the more creative-minded and those who like to understand everything, jump to Sukkology 101 by Tzvi Freeman. Ever since, we remember G‑d’s kindness, and reaffirm our trust in His providence, by “dwelling” in a sukkah for the duration of the Sukkot festival, from the 15th through the 22nd of the Hebrew month of Tishrei (in Israel, through the 21st only). 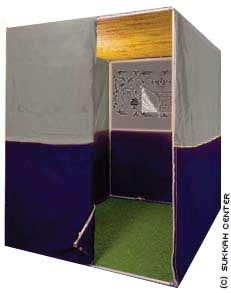 A sukkah is essentially an outdoor hut that is covered with vegetation, known as sechach. But there are many guidelines and requirements that must be followed in its construction, and regarding the location where it is erected, in order for a sukkah to be deemed “kosher”—fit for use. There are excellent prefabricated sukkahs available, in a variety of sizes, from many Judaica vendors. If you choose this less adventurous (and less time-consuming) route, make sure that the sukkah comes with proper rabbinical certification that it meets the requirements. Where Do I Build My Sukkah? Construct your sukkah outdoors, ideally in a spot that’s most accessible to your residence. Popular sukkah locations include: porches, backyards, courtyards, lawns, balconies and rooftops. Basically, any location under the open sky. An important requirement is that there should be nothing between your sukkah and the open sky. So make sure that there are no trees, canopies or roofs of any sort overhanging your sukkah. The Walls: The walls of a sukkah can be made of any material, provided that they are sturdy enough that they do not move in a normal wind. You can use wood or fiberglass panels, waterproof fabrics attached to a metal frame, etc. You can also use pre-existing walls (i.e, the exterior walls of your home, patio or garage) as one or more of the sukkah walls. An existing structure that is roofless or has a removable roof can also be made into a sukkah by covering it with proper sechach. The Roof Covering: The sukkah needs to be covered with sechach—raw, unfinished vegetable matter. Common sukkah roof-coverings are: bamboo poles, evergreen branches, reeds, corn stalks, narrow strips (1×1 or 1×2) of unfinished lumber, or special sechach mats. Mats made of bamboo, straw or other vegetable matter can be used only if they were made for the purpose of serving as a roof covering. The sechach must be detached from its source of growth—thus a live trellis, or branches still attached to a tree, cannot be used. You may use only vegetable matter that has not been previously used for another purpose. Additionally, it must never have acquired the status of a utensil (through being used as part of a crate or tool), nor have been capable of becoming ritually impure. You may also need some plain, unfinished wood beams to construct a framework on which to lay the sechach. Lighting: If you’d like to set up a lighting system, and your sukkah is built close to an outlet, purchase a lightbulb with a rain protection cover and electrical cord. Chairs and Tables: Remember, you will be taking all your meals in the sukkah for the duration of the festival. Plus, it is a special mitzvah to invite guests to share your sukkah. A sukkah must have at least two full walls plus part of a third wall (the “part” needs to be a minimum of 3.2 inches wide). It is preferable, however, that the sukkah have four complete walls. The walls must be at least 32 inches high, and the entire structure may not be taller than 30 feet. In length and breadth, a sukkah cannot be smaller than 22.4 inches by 22.4 inches. There is no size limit in how large—in length and width—a sukkah may be. There must be sufficient sechach to provide enough shade so that in a bright midday there is more shade than sun seen on the floor of the sukkah. The sechach has to be spread out evenly over the entire sukkah, so that there should not be any gap larger than 9.6 inches. Anything that is directly supporting the sechach should not be made out of materials that are not fit to be used as sechach. Thus, if the sechach rests directly on the sukkah walls, strips of wood may need to be used to support the sechach. In addition, the sechach should not be be tied with wire or fastened with any metal object. A sukkah must be built anew every year for the purpose of the mitzvah. This requirement, however, applies only to the sechach, since it is the sechach that makes the sukkah a sukkah. Thus, one can leave the walls standing all year, and place the roof covering before the festival. If the sukkah and the sechach have been up all year, one can simply lift up and replace the sechach, which allows the sukkah to be considered as new. One must first erect the walls and only then place the sechach covering. If the sechach is put up before there are walls in place, the sechach should be lifted up and reapplied. If there is a gap between the bottom of the walls and the ground, the bottom of the walls must be less than 9.6 inches from the ground. If the walls are at least 32 inches high, the roof may be higher (up to the maximum height of 30 feet off the ground), as long as the walls are beneath the roof. The sechach should be placed on the sukkah by a Jewish person—one who is obligated to sit in the sukkah. We do not put on Tefillin on the first two days of Sukkot. With regard to the Intermediate Days, there are differences of opinion. Sephardic Jewry, chassidim, and certain non-chassidic segments of Ashkenazi Jewry, do not wear tefillin on Chol Hamoed. Dwelling in Sukkah It is correct that we need to live in the Sukah for the duration of the holiday. Yet there are certain situations, for example sleeping, which are exempt as it is not similar to the way one would live at home. Please see here for a fuller discussion of this. I understand that you are asking in a case that the sechach fell and you need to eat in the Sukkah on Yom Tov, when it is forbidden to put it back up yourself. In such a case you can try to get a non-Jew to replace the sechach without telling him directly to do so. Rather, hint to him "we cannot eat until the sechach is back up" or something similar. On the intermediate days (chol hamoed), you should have a Jew put the sechach back up. Re: triangular sukkah It would be kosher as long as it was large enough to contain a square of 56 cm. by 56 cm. The optimum sukkah, however, has four complete walls. Why settle for less? Can the roof of the sukkah (sechach) be supported by several pvc poles? Concerning the latest questions I've added a short note at the beginning of this article. This year, we published a much more comprehensive guide to what's kosher and what's not when building a sukkah. Instead of just listing the rules, we provide the reasoning behind it all. That makes it much easier to absorb.